Stacked and clustered (or grouped) bar charts are standard data visualization tools used for business purposes on a regular basis. Stacked charts are typically used to investigate components in a category that aggregate while cluster charts are typically used to measure components across categories that do not aggregate. 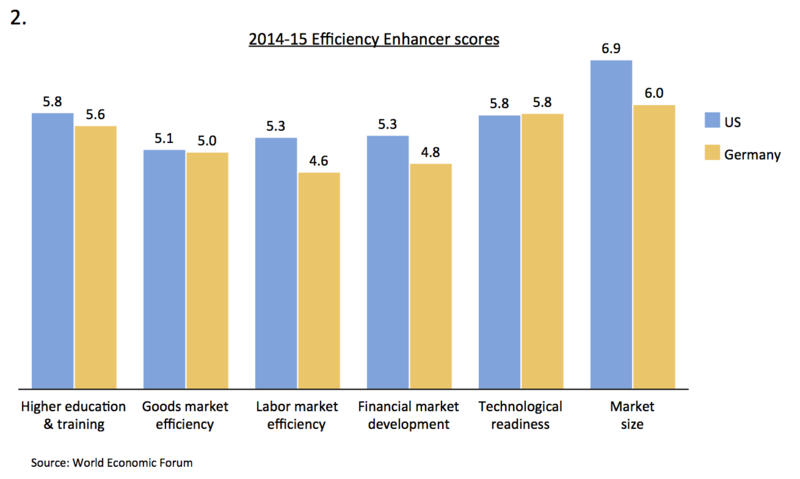 In example 1 we use the stacked bar chart to examine the Economic Enhancer components for the US Global Competitive Index across three time periods (published by the World Economic Forum). Here the scores are aggregated (the World Economic Forum equally averages them) and the stacked bar chart is natural visualization option. 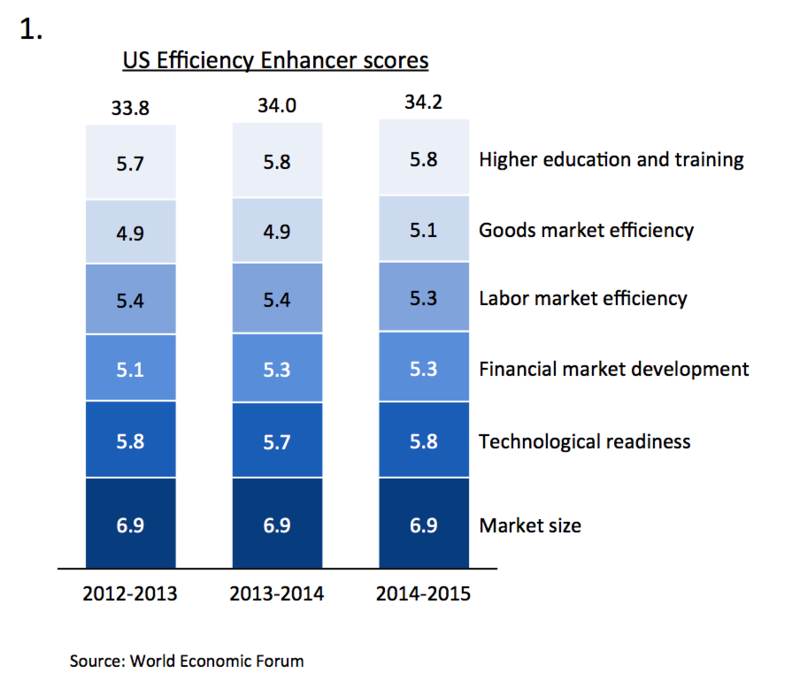 In example 2 we use the cluster or group bar chart to examine how the United States and Germany compare for each component used in the Economic Enhancer metric in a single time period. As the scores are not combined here, a cluster or group bar chart is more appropriate. However, there are times where we would like to be able to combine the charts so that we can compactly examine two sets of data where each set is made up of components that aggregate. 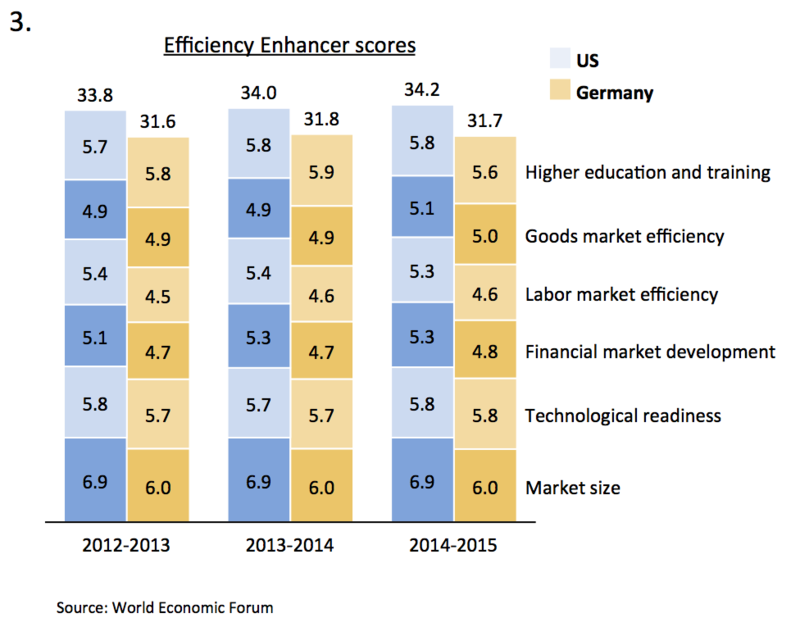 In example 3 we use a combination stack-cluster chart to achieve this and effective examine the Economic Enhancer components for both the US and Germany across the 3 time periods. Most data visualization tools are unable to naturally create a stacked-cluster combination. Users are forced to develop workarounds that are time consuming and not easily editable. With Aploris, however, users are can use the stacking editor to quickly create a stacked-cluster combination starting from either a regular stacked or cluster bar chart. By right-clicking on the blank spot on the chart users can pull up the stacking editor and simply drag and drop elements to create the desired stacked-cluster combination chart. This entry was posted in Chart usage and tagged Bar chart, Stack-cluster combination on April 21, 2015 by Aploris. As the name implies, the 100% stacked bar or column chart uses the percent unit for the y-axis. As a result, if you are comparing across multiple groups/bars, each would have the same height taking up the full range of the value axis. The chart is typically used when the author wants to highlight the portion of the total that each segment in a bar comprises. The chart is especially useful when comparing across groups of different sizes or along a timeline. In the example below, we use the 100% stacked bar chart to examine educational attainment in specific US geographies. Relative to the rest of the US, a higher portion of Silicon Valley and San Francisco residents have a Bachelor, Graduate or Professional degree. The 100% stacked column helps the reader quickly arrive to this conclusion. If we had used a regular stacked chart the American population would have dwarfed Silicon Valley and San Francisco making the key message difficult to obtain. Still the sum displayed on top of each column gives insights into the absolute numbers behind the percentages in the 100% chart. The 100% stacked bar chart is a standard Aploris offering. With Aploris, the user can switch between regular and 100% stacked bars with the just a few clicks allowing them to quickly test which graph best communicates the intended insight. In addition, Aploris labels can be automatically adjusted to show the absolute value, the percent of the total, or both. This entry was posted in Chart usage and tagged Bar chart on February 12, 2015 by Aploris. Once again we found a chart worth mentioning here. It shows the self-assessment of women in different age groups regarding their risk of a heart disease according to a current study. At first sight we actually saw only a number of seemingly random columns. So we thought about a clearer representation. In the first chart using clustered bars it is the viewer’s job to summarize and contrast the figures of the age groups. 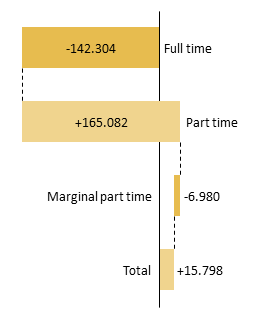 A stacked column chart seems to be better suited to convey the statistics. Apparently, older women have a far more negative view about their risk of a heart disease (a more realistic one according to the story). Visually adding up “high” and “medium” values by stacking and displaying connector lines seem to help a lot to understand the data. This entry was posted in Info graphics review and tagged Bar chart on May 27, 2014 by Aploris. Starting the value axis of a chart – usually the y-axis – at a non-zero value can visually exaggerate the initial insights that the reader draws. In example 1 below, the first instinct is to think that there is a >80% difference between 2010 and 2014. Once we extend the y-axis to 0, however, we see that the differences are quite minor (example 2). That’s not to say that all charts should have a value axis that starts at 0. If, for example, we were looking at temperatures in the charts above starting at 0 Kelvin would make little sense. In general, the value axis range should include the reasonable range of the data and not deceive the reader. If, for example, we were looking sales data above it is reasonably plausible to have 0 sales and therefore the y-axis should likely extend to 0. On the other hand, in a certain scenario a business analyst may have found out that a large share of sales is fixed. In that case she may want to focus on the fluctuations above a certain level like in example 1 above. So the right way of presenting the data always depends on the story it is supposed to tell and the insights the designer wants to share. Advanced chart tools like Aploris have the ability to edit the format of an axis to ensure it appropriately depicts the chart data and supports the message to the reader. This includes editing the axis range and tick mark intervals, using 100% and logarithmic scales as well as inserting axis breaks. This entry was posted in Chart usage and tagged Axis, Bar chart on April 21, 2014 by Aploris.